14 Nov 2014 14 Nov 2014 wcalvinandersonmed1 Comment on Nassau, Bahamas: Homegoing Services for Beloved Dr. Myles Munroe “Kingdom” Ministry Teacher! Nassau, Bahamas – A Memorial Service for Rev. Dr. Myles Munroe has been announced for December 4th, 2014 at the Thomas A. Robinson Stadium in Nassau. Memorial Services for Pastor Richard Pinder will take place on December 3rd at Bahamas Faith Ministries headquarters. Munroe’s Funeral will be held on at the Bahamas Faith Ministries Church on the 5th of December. Dr. Myles Munroe and Pastor Richard Pinder both perished with seven others, including Mrs. Ruth Munroe on Sunday, November 9th when his Lear jet crashed at the Grand Bahama Shipyard. It was en route from Nassau. Reports said that the plane clipped the side of a crane at the Shipyard and “exploded on impact”. The weather was said to be a factor. The nine passengers aboard the plane belonging to Dr. Myles Munroe were heading to Grand Bahama for the Global Leadership Forum scheduled for November 10th through 13th to be hosted by Myles Munroe, the leader of Bahamas Faith Ministries International, which did take place despite the tragedy. 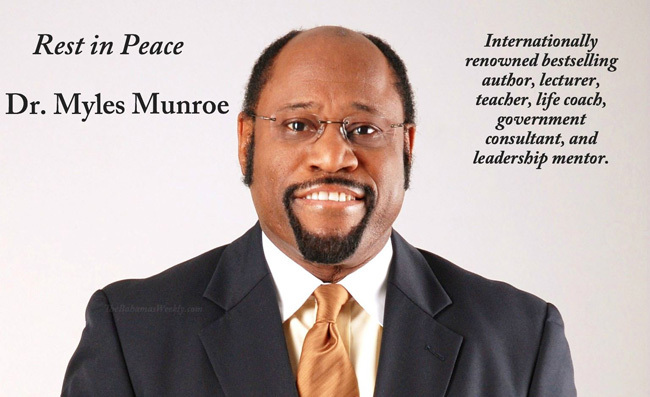 Dr. Myles Munroe was an internationally renowned bestselling author, lecturer, teacher, life coach, government consultant, and leadership mentor. He had travelled around the world training leaders in business, government, education, sports, media, and religion. This multi-gifted motivational speaker served as a business consultant to governments, Fortune 500 companies and corporations, addressing critical issues that affect every aspect of human, professional, leadership, social, and spiritual development. Dr. Munroe represented his country as the youngest recipient of the Queen’s Birthday Honors of the Order of The British Empire (OBE) Award 1998 bestowed by Her Majesty, Queen Elizabeth of England, for his spiritual and social contributions to the national development of the Bahamas. He had also been honoured by the government of the Bahamas with the Silver Jubilee Award (SJA) for providing twenty-five years of outstanding service to the Bahamas in the category of spiritual, social and religious development. Pas. Myles was the senior pastor of Bahamas Faith Ministries International Fellowship, where his wife, Ruth Ann, serves as co-senior pastor. He was a proud parent of Charisa and Chairo (Myles Jr.). He was 60 years old. God is omnipotent and omnipresent and He knows best. We celebrate the life of this passionate and wonderful teacher and human being! To the family of dr. and mrs.myles munroe; i am so sorry to hear of dr. myles and ruth ann, with others passing in the crash,; i am sorry to just know about it, during that same time, my only sibling was very ill in the hospital which rocked my world, our parents have been deceased a long time, so when my sister who was born severely mentally disabled, she was diagnosed with lung cancer suddenly, i was emotionly in denial even though i watched her very ill, praying for a miracle; she did pass october 30, and funeral was november 24; anyway now i have been watching your dad and mom’s memorial and funeral services; my heart brakes for you charissa and chairo jr. and i pray for you two everyday that the grief is replaced with the joy of the lord forever til you see them again, and i pray the lord jesus christ keep you two covered by his blood from any and all evil, spirit, soul, and body; love you, and God Bless yah Forever more. Previous Metro Atlanta Loves Musician, Songwriter Ragan Whiteside’s Flute in “Quantum Drive”!